I waited three seasons for this to flower. 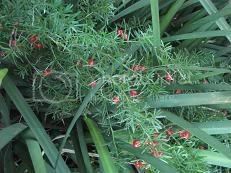 As I was going round the garden pruning and liquid-fertilizing, I marveled at how time could not be rushed, how waiting was paying off, and how often my energy was misused in being inpatient. Since I came back from my baking classes in San Francisco, I had made 6 less than satisfactory breads; three on my Kitchen Aid Artisan stand mixer (which has a C hook, not the spiral hook which comes with the Kitchen Aid Pro stand mixer), two on my Panasonic bread machine (dough mixing function only) and one by hand. I find it hard to adapt the techniques I learned in the baking school to home set-up - our equipment are different, our starters are different, and our dough temperatures are perhaps different too, etc. etc. Our instructors foresaw these problems, and they emphasized the need for us to learn to "read" the dough rather than mechanically following instructions or formulas. We were asked constantly during the mixing process to check gluten development by window paning and by simply tugging at the dough to feel its strength. But all this is easier said than done. All that I can do is to keep trying. 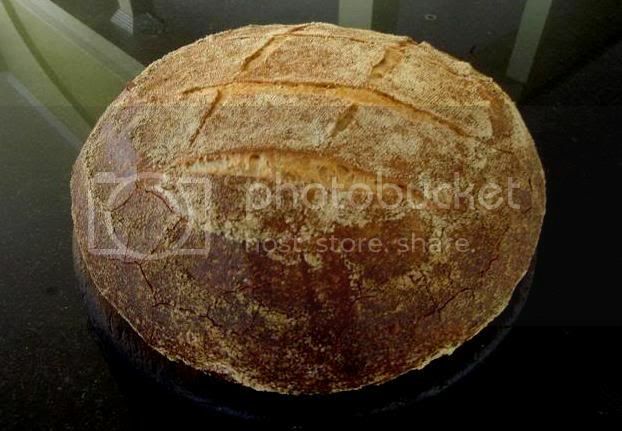 The idea of this 7th bread came indirectly from Safa, our instructor at the Artisan I course. It was my last Saturday in San Francisco; I was on my way to Ferry Plaza market and I ran into him on the train; we chatted all the way. He said he recently made a bread and he called it 30/30, not that there is anything magic about the number 30, but it's just that it is easier to remember since it has 30% soaker and 30% levain (in relation to final dough flours). So here I experimented with my 50/50 - 50% Poolish and 50% Levain. 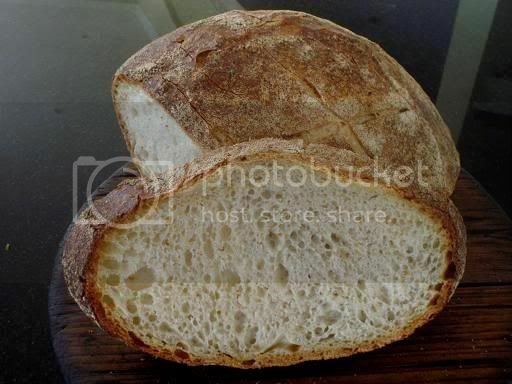 The purpose was to see how this would vary sourdough's flavor profile. I have learnt that the acidity you get from poolish as well as levain that is fed more frequently than just once a day is lactic acidity (e.g. yogurt) as opposed to acidic acidity (e.g. pickles). A classmate at the Artisan course who had done the bakery tour at Boudin bakery museum in San Francisco told me he saw a baker there use the starter straight out of the refrigerator. Their San Francisco Sourdough is famous for its sourness which is not to my taste. I imagine if the starter is fed only once a day and is kept in the refrigerator for part of the feeding cycle such that it stays in the anaerobic condition for a long time the acidity can be developed quite strongly. I am a fan of Chad Robertson's rustic sourdoughs. I was reading about him in "A Day in the Life at the Bay Village Bakery" in the Bread Builders and Alain Ducasse's Harvesting Excellence; and interestingly it is mentioned that he uses a brief two-hour final stage of levain expansion before he mixes up his doughs. I imagine this "levain expansion" would be the aerobic stage of levain build-up where the little beasties are in rapid reproduction (rather than fermentation). I don't know for sure but I imagine too his levain would be fed more than once a day and would most likely sit in room temperature. I mixed all ingredients in my Kitchen Aid for 4 min at the first speed then another 6 min at the 4th speed, at which point the dough did not feel very strong. I pulled it out of the mixer any way because I planned to supplement by stretch and folds during bulk fermentation. I placed the dough in an oiled container and gave it two letter folds. After the first letter fold, the dough was rotated 90 degrees then letter-folded again, and then the dough was turned upside down so that the folds faced downwards (ie, right side was up). Bulk fermentation was 2 hours with a set of two letter folds (as above) every 30 minutes. I turned the dough over first (so the right side was down) before I did the letter folds and when I finished the folds, I turned the dough over so that the folds faced downwards (the purpose was so that the dough stayed tight.). After 2 hours, I pre-shaped the dough into a tight ball, and while it was resting, I dusted a linen-lined basket with medium rye flour. After a rest of 20 minutes, the dough was shaped into a boule and placed in the basket and covered with a plastic bag. I placed it into the refrigerator to retard (for 13 hours). The next morning the dough was baked cold at 220C / 440 F for 50 minutes with steam for the first 10 minutes. This sourdough has the flavor profile that I like: the lactic acidity from the Poolish and the levain, the sweetness from the bread flour, and the richness from rye and whole wheat. All round the flavor is complex and the after taste is long lasting. It is mildly chewy, very pleasant. Beautiful, as always, Shiao-Ping. I enjoy your postings so much, thank you for the time you give to posting here. 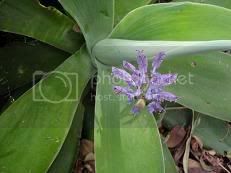 The name commonly used for No Name Flower Number One here in Southern California is African Iris. I don't know the scientific name. They are a popular garden plant here. We had them at our first house and transplanted them to our current house. 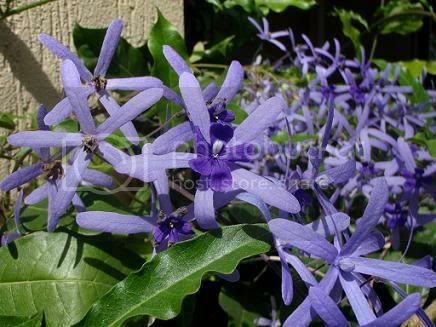 They divide easily and are very hardy and require little water. 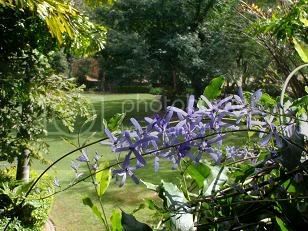 Your garden is so lovely and green, thank you for the pictures. You are right that the plant is a very hardy plant. We had had a serious drought up until late last year in Australia and I have never watered them but they seem to do alright. Every season the flower comes back and every time I see the flower I feel guilty of not having been looking after them. Beautiful write-up with photos, Shiao-Ping. I enjoy them so very much! 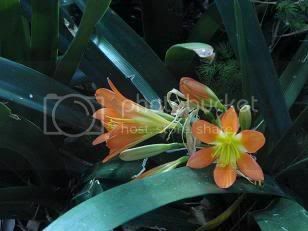 The #2 flower is call a Kaffir Lily or 'Cliviaminiata'..I have them all along a pathway to my front door. I also have some in yellow. They love the shade and grow well in pots or indoors..I divide them and now have several. I have read you can get seeds from the pods to plant. The seeds must be fresh. Planted 75-80 degrees and sprout in about 30-40days! I love their hugh bouquets of flowers. some kind of lily but was not sure of the exact name. The previous owner of our house planted them; I never knew they existed until they flower. I see that you have a green thumb yourself. You made one, 1.2 kg loaf, right? Very interesting formula. Nice crumb and gorgeous crust. I love the crackles in the crust. Did you leave it in the cooling oven after it was through baking? Regarding bloom: I think there are two variables you may want to modify(since over-proofing is not an issue with your procedure). One is to preheat your oven to 500F, then turn it down to your desired temperature after loading the bread. The higher heat, especially the heat conducted from a baking stone, gives an initial burst of oven spring that can spread your cuts. The other is playing with how you steam the oven. 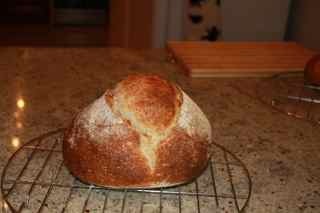 Covering the loaf with a bowl for the first 10 minutes results in the most pronounced blooming, in my experience. 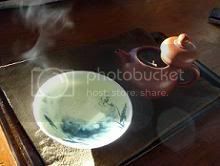 Next best is double steaming with a skillet and lava rocks, as I described a couple days ago in my blog. These are "home" techniques that probably replicate a steam injection oven imperfectly. With your recent experience at SFBI, I would love to read your thoughts about oven steaming issues at home. Beautiful flowers! 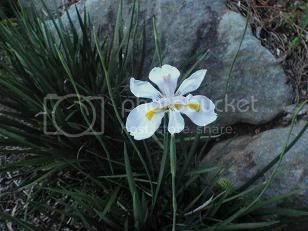 "No name flower" number 1 is also known as "Butterfly Iris." Yes, David, I made one 1.2 kg loaf. Did I leave it in the cooling oven after it's done baking? I did not but I could. While I understand that it is desirable to "dry out" the crust a bit more in the cooling oven, my family generally does not like the curst too crackling. 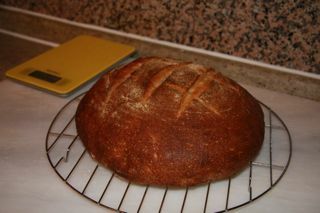 I guess with a loaf this size, it will also work if I do 30 minutes at 230C / 450F and another 20 - 30 minutes at 200C / 400F. It all depends on what effect we want and what crust we want I guess. Thank you for your suggestions with regards to bloom. I will definitely give them a try in the next bake. They placed this pierced foil cake tin on top of the lava rocks when the oven was pre-heating. After the loaf was loaded onto the baking stone, they poured (I think) 2 cups of water into this cake tin and quickly closed the oven door. An enormous amount of steam was generated (but a lot seemed to have escaped the instant just before the oven door was shut). The many pierced little holes are so that the water can trickle down to the lava rocks. I remember at the time I was thinking to myself "wouldn't that be too much water to be pouring into the oven?" But the loaf came out beautifully. I would have used less water for fear of cuts being sealed over in too much steam. "Butterfly Iris," what a lovely name. Thanks. I'm struck by the crackly crust you got. I have felt that drying in the oven after the bake is necessary to get this effect. However, I also think this is more easily achieved with lower protein flours. The "bread flour" you used has the same protein level as KAF AP. KAF bread flour has 12.7% protein and tends to give me a crunchy crust rather than a crispy crust. The perforated pie pan is quite an idea! It would certainly prolong the delivery of steam, but the effect of evaporation from the pan and the constant trickle of water over the lava rocks would cool the metals so I wonder if you would not really get the burst of steam you get pouring water on the rocks, just oven humidification. Even if this is a correct prediction, does it make a difference? And if it does, which yields superior results? Are you planning to try this at home? My local grocer carries thin aluminum baking tins in a wide variety of shapes and sizes. I'm thinking of trying a mini-loaf pan that would cover about half my lava rocks, so I can pour some water into the pan and some over the rocks. Oh, boy! More experiments (and excuses to bake bread)! David, if you write a book about home artisan baking techniques, I will buy. I bet no one has done more experiments than you do. I don't plan to try the perforated pie pan idea for steaming because I am happy enough for the steam created from pouring water onto lava rocks. As in the case of lava rocks, I think the burst of steam you get from using perforated pie pan is only in the beginning (that was what I remember observing during their experiment at SFBI.) At SFBI their professional oven come with something that injects steam. Just before the loaves are loaded onto the stone, our instructors would press steaming for two seconds, then load the doughs, then steam for another two seconds. The steam is so strong that, if you stand right in front of the oven when it is being injected and the oven door has not been shut properly, you might get hurt. The cracks in the crust occur when the crust contracts with cooling faster than the interior of the loaf. 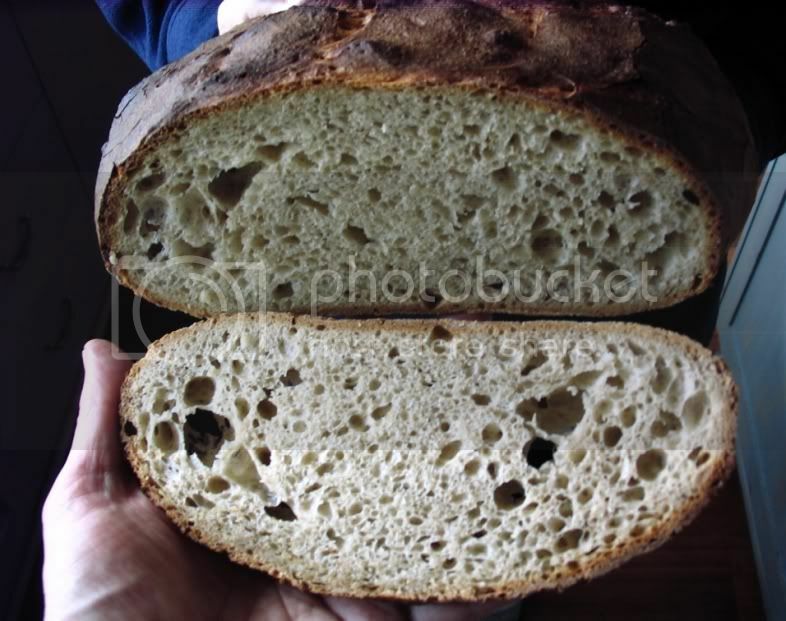 This difference is due to the crust being dry enough so the moisture from the crumb can no longer penitrate it. The loaf singing is due to contraction of the crust, so I don't think you would ever get a crackly crust in a loaf that doesn't sing, but the loaf singing does not guarantee crackles. I think my oven retains steam well. This requires I replicate the "venting" of a commercial oven some other way. I have seen recommendations that the bake be finished with the oven door ajar for the last few minutes. I think the goal is to dry the surface of the loaf. How you do it depends on your oven and other variables I'd need to think about more. You're an expert!! A crackly crust is impossible in a mute loaf, but a singing loaf is no guarantee for crackles. Singing or mute, that made me chuckle! Your explanation is clearer than Dr Snyder's diagnose. I am re-reading your comment. I am really no good at technicals. Can you tell me why the loaf singing is no guarantee for crust crackles? Here's my thinking: What we call singing and the crackles in the crust both result from a dry crust contracting as it cools. I think the auditory signal (singing) is more sensitive than the visual (crackles in the crust). That is, we hear a lesser degree of crust contraction than we can see. The contraction has to be more pronounced before visible cracks appear. I thought that was what you meant; many thanks for confirming it. For what's its worth, on the few occasions where my baguettes have produced a crackly crust, the first sign I've always had is the loaf singing. Then as I've watched it closely, I could see the crust beginning to form fault lines along the sides- usually running horizontally at first - as it continued to sing. Doesn't happen to me nearly as often as I'd like, but it's a delight to listen to and observe when it does! that the singing and crackling occur more often when the heat is high and the baking is (relatively) short such that the crust is baked not too thick? 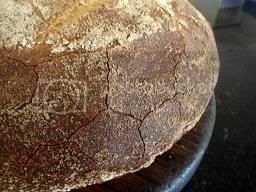 I do get crackly crusts in big loaves where the baking time is long and the heat is relatively low, the crackles, however, are never nearly as many as when the crusts are thin (where the baking time is short and the temperature is very high). 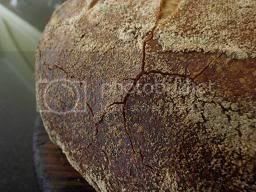 David said he seems to have observed that many of my bakes in this blog have crackly crusts, I wonder if that is simply because my family like thinner crusts and therefore I tend to bake my loaves for slightly shorter duration of time. What I am saying is, my crackly crusts are not because of my better technique (and neither his relative lack thereof due to poorer technique), my crackly crusts are simply a matter of chance. The only crackly crusts I've been able to obtain have been with baguettes baked at fairly high temps - 230 - 240 C. So while my baguettes and your loaves both have thin crusts, you are achieving your crackles with much larger loaves. I like David's explanation, although with baguettes I wonder if there's that significant a difference in cooling internally and externally. For me they are still something of a mystery: sometimes they 'happen,' sometimes they don't. I have noticed that when it's been very humid here, I've not been able to obtain them (I think obtain is a better word than achieve for me, since if I have anything to do with the process, I'm clueless as to what it is :-). I can certainly empathize with the frustration of trying to reproduce in a home environment what you achieved at the baking school. My initial attempts at baguettes after returning from King Arthur left me feeling very deflated. But I've learned to identify those elements that are most difficult to reproduce (or, in the case of my oven versus their commercial oven, impossible to replicate), and over the past few months I've tweaked things and tried things and my results have improved noticeably and continue to. That said, I would be ecstatic if I could produce loaves with the delicate and tasteful patterns and scoring that yours exhibit! Your sourdough 50/50 is a case in point! That's exactly how I felt after my first few bakes back home! I will learn to "tweak" things as you have done so. Thank you. It's a big encouragement. Your 50/50 is a beautiful loaf. I'm wondering how it would be without the overnight retardation? The crust is perfect. I was told that the overnight retardation gives you the blisters that American home bakers like but not their French counterparts. I do retardation not for the blisters but for the flavours. I find in general when the dough goes through lower termperature while it slowly ferments, the flavour of the final product is more subtle and complex and longer lasting. But with this 50/50 I can see where you're coming from - since the poolish has already gone through 6 - 8 hour fermentation before mixing into the final dough, you're wondering how the flavor would be like without the retardation. I think the comment above still stands. Thanks for sharing SFBI's steaming experiment for the home oven. 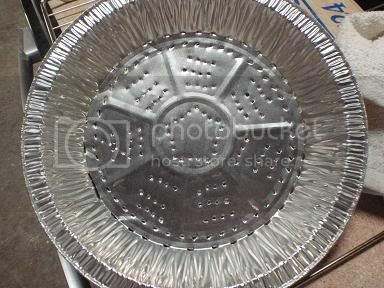 I don't think I've ever seen as sturdy a foil pan as they used, except for ones used for turkeys. 2 cups is alot of water!! All in all, still a beautiful loaf. I had a look but I don't think they are the same. The one I have is quite common over here. 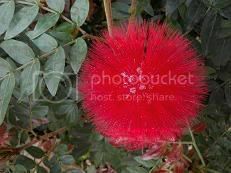 The bush can go up to 1 + 1/2 meters tall, is never very bushy, and always looks daggley to me. I wanted to see what would happen if I didn't score it! I didn't taste it yet, I will do a second batch and score it,I am sure it will be more attractive. That looks great! Every time somebody does the recipes in my post, I have to say I am amazed when it worked! Somehow even though I tried to be specific in my formula, I have no confidence that it can work for other people mainly because most if not all of my recipes I did it only once (if it is to my satisfaciton), so they may be a fluke. I rarely do same recipes that I developed twice. And here is the crumb! Wait for the second batch tomorrow! I am very pleased with the bread myself. 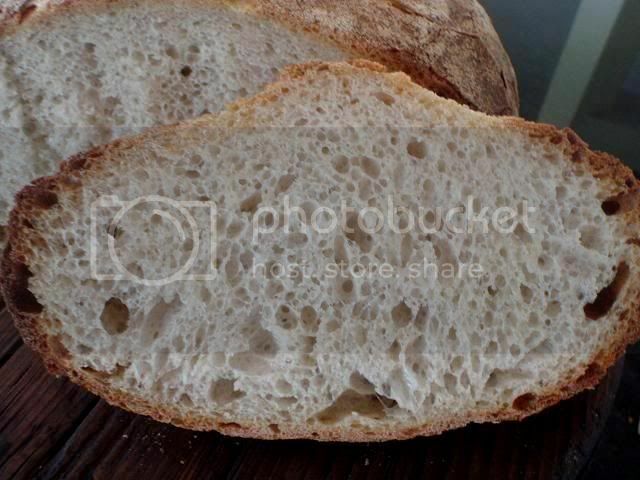 As a matter of fact, everytime you post a new blog recipe I print it and I am preparing to test the bread; they are ALL great breads and it's so much fun to have the whole background about them, a joy to read and a joy to bake, keep it up, it's great. Country Sourdough also tomorrow! Let me know if anything needs altering. There it is; all 1kg of it! Thanks for showing us the photo. I am about to make your 50/50 bread, have prepared the levain and poolish, and early evening will get on to the dough. Re retarding the dough overnight in the fridge: do you think it would matter if I left it in for two days, rather than overnight? I've suddenly realised I've timed this one badly, as I have appointments I must keep tomorrow, and would rather bake the morning after tomorrow. Is there a general rule re retardation? I've left pizza dough refrigerated for 2 or 3 days and still had a great result, but not sure about bread generally. I have never retarded a shaped dough over and beyond 21 hours or so (I first read about this magic number in David's post; see his San Joaquin Sourdough from his recipe index: http://www.thefreshloaf.com/node/11667/dmsnyder-recipe-index). It might be OK because the pre-ferments have not been fermented very long before final dough is mixed) but I am really no expert in the retardation issue. 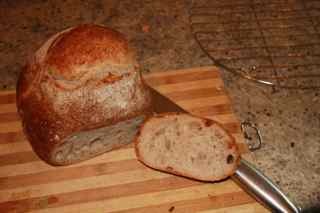 The easiest way is of course to try it; if the baked loaf comes out pale in color that means it is over-proofed. I think this kind of sourdough with the volume and shape we want is very different from pizza because anything is ok for pizza. What I meant was - I think any dough is ok for pizza (from a batch that has just been mixed up an hour ago to dough that has been sitting in the fridge for 7 days! 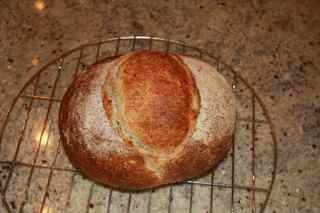 ), whereas an artisan style of sourdough is not. Hahaha! Yes, I know what you meant, and I agree - pizza dough is very forgiving. OK, I'll give it a go and see what happens. Thanks, Shiao-Ping. PS: I ended up fermenting the poolish and levain for about 20 hours (I think it will still be fine - it's quite cool here at the moment). So anything could happen...if it's a disaster, nothing to do with your directions/recipe, and everything to do with me! Well, I changed my arrangements to accommodate my baking (this is getting all-controlling!). I thought the dough looked ready, as it had risen more than expected in the fridge overnight. So, only an overnight retardation, rather than the 2 nights I was anticipating. The bread came out pretty well. Crust was a bit darker than I like, but the crumb was the best I've managed so far - very open and elastic, and soft - and the flavour was good. All credit to you for this great recipe, Shiao-Ping. Here's a pic of an early slice (the crumb was more even further into the loaf)...and yes, the appearance is not polished and professional as we've come to expect from Shiao-Ping. I like to refer to my loaf as "rustic", but that's rather kind, I know! Next time - and there will be a next time - I will reduce my oven temp a bit and see if I can keep the crust more of a golden brown, rather than dark as it was this time. Frankly, the darker crust appeals to me. More flavor, for one thing, and I like the way it looks. Aiming for a lighter crust might leave your crumb wetter than you want, so you'll probably have some experimentation to determine the right temperature and time to get the results you want. I don't mind a darker crust, and agree about the extra flavour - but this one was a bit beyond optimal for my taste. The flavour had tipped over into a bitterness, which dominated the more subtle flavours struggling to be noticed underneath. I don't anticipate a lot of temperature tweaking to get what I'm after...but we shall see. Well, my goodness, that looks awesome! and I don't mind the curst; but I understand what you're saying about the bitterness. Thanks for showing us the great picture! A pleasure, Shiao-Ping - any compliment from you is a compliment indeed! Thanks for all your inspiring posts.